At least two of Stradivari’s sons were employed in the family workshop, but we know very little about what they actually did there. What can be detected from the instruments themselves? The story of Antonio Stradivari’s sons is a tricky one to negotiate. The objective view must be that Antonio did not make over a thousand instruments entirely by himself, even over his remarkably long life. But such is his almost mythical status that to attribute any part of his work to other hands can seem blasphemous. Traditional values and attributions stand in the way of an unbiased interpretation of the available facts. So let’s first look at what is known and undisputed according to the available evidence. Antonio Stradivari was born in 1644 or 45 and began his independent career as a violin maker in 1665 or 66. His first marriage, to Francesca Ferraboschi, took place in 1667. She bore him two sons, Giacomo Francesco (b. 1671) and Omobono (b. 1679), who grew up in the family home and workshop. Another son, Alessandro (b. 1677), entered the priesthood. Francesca died in 1698, but only a few months later Antonio remarried Antonia Maria Zambelli. Antonia brought five more children into the world, four of whom were boys and potential heirs to the workshop. Antonia’s first son, Giovanni Battista Giuseppe (b. 1701), did not survive his first year. The third son, Giuseppe Antonio (b. 1704), joined the priesthood. The fourth, Paolo (b. 1708), became a cloth merchant, but did play out the final acts in the drama of the Casa Stradivari. It is the second son, Giovanni Battista Martino (b. 1703), who is the most unfamiliar and interesting to us. Stradivari’s three daughters, Giulia, Francesca and Caterina, followed traditional roles in 18th-century society. Giulia (b. 1668) married into the Cremonese aristocracy, perhaps giving her father a useful foothold in society. Francesca (b. 1700) entered a convent aged 19. Caterina (b. 1674) remained unmarried and dependant on the family in the Casa Stradivari. While we might expect that she remained in a domestic role, the possibility that she may have been active in the family business cannot be excluded. Carlo Chiesa’s discovery of Antonio Stradivari’s Testament in 1995 shed much new light on the family, the most dazzling revelation being that a previously unknown son, Giovanni Battista Martino, lived and worked in the home until his premature death in 1727 at the age of 24. Suddenly we had not just two sons known to be active in the workshop, but the probability of a third, Giovanni Battista. A great deal of what had already been presumed about the elder sons, Francesco and Omobono, is confirmed by the Testament. Francesco is identified as Antonio’s chosen heir and described as ‘the principal support of the profession of the Testator… in whom he especially confides.’ On the other hand, Omobono is effectively dismissed. His father seems to have resented Omobono’s absence from the home for what he claims to have been some two and a half years, and leaves to him only the amount that Antonio feels was still owed him for the expenses of this trip, almost 40 years after the event. Significantly though, he does bequeath him certain tools, but on the condition that they are not removed from the workshop. There is clearly a breach in the family, and although in another clause of the will Antonio begs all his children to remain together in the home, Omobono’s name alone is not mentioned. We can now consider the implications of all this on the Casa Stradivari, and try and assess what it adds to our interpretation of the instruments that it produced from 1666 to 1748 and beyond. After Antonio’s marriage in 1667 he worked alone. His early output consisted of violins of quite personal form, loosely linked to his contemporaries, Francesco Rugeri and the Amatis, but distinct from both in details of form and structure. He also built the highly original ‘Mahler’ contralto viola and many forms of plucked instruments. By 1680 his style had begun to settle and become more consistent, and the instruments made in the 1680–1700 period can be seen as the true autograph of the man. By the traditions of late renaissance society Antonio’s eldest son, Francesco, would have started his apprenticeship around the age of 13. 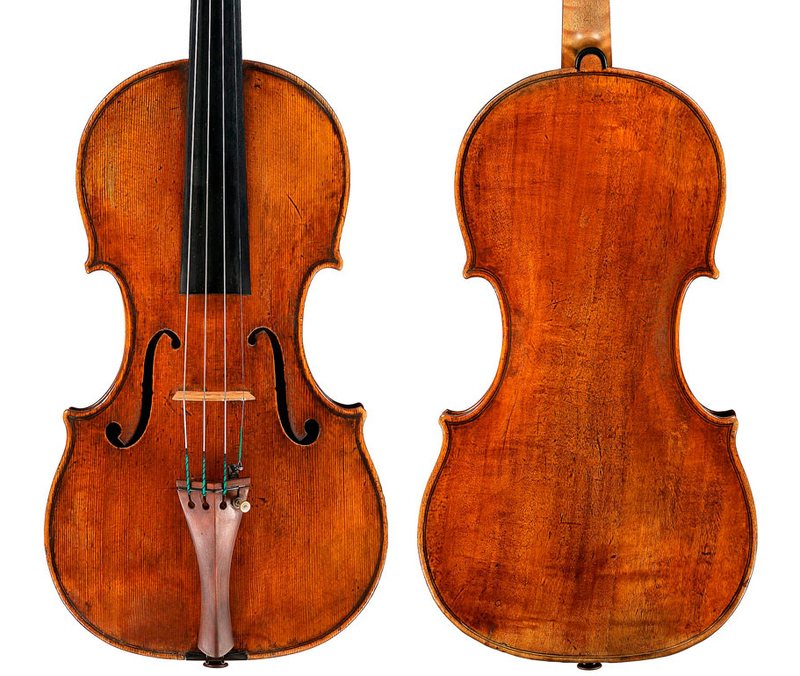 He reached this age in 1684, the year of the gorgeous ‘Bonjour’, ‘Visconti’ and ‘General Kyd’ cellos, exemplars of Stradivari’s beautifully proportioned and perfectly crafted ‘Amatise’ period. The young Francesco would also have been familiar with the wonderful inlaid instruments, the majority of which were made before 1700. Antonio was obviously a master inlayer. The purfling of these instruments is done in a distinctive and sure-handed manner that seems clear in all his work, and is one of the most significant identifiers of his own hand. By 1692 we can imagine Omobono beginning his training, while by 1696 Francesco was 21, and we can be pretty certain showing signs of being a very competent craftsman. He may also have been asserting himself with his own original contributions to the workshop. But in 1698 Antonio suffered two shocks: his wife died and Omobono departed for Naples aged 19. Whether the two events were connected we can only guess, but from the evidence of the Testament Omobono’s absence seems to have broken Antonio’s confidence in him. On his return, he found his father remarried and already with a new daughter, Francesca Maria. Thereafter Omobono had a lesser role in the workshop and, according to most sources from Fetis onward, was involved in the setting-up and regulating of instruments. His hand, where it can be identified in later work, is not decisive or entirely comfortable with the task. He was possibly more involved in general management of business affairs, as we know he traveled on behalf of his father and other interests to Castell’arquato in Piacenza in 1728 and to Modena in 1731. In 1709, at the advanced age for the period of 66, Antonio embarked on his truly revolutionary transition into his ‘golden period’, with the 38-year-old Francesco at his side. Already middle aged himself, and certainly a well-trained and gifted craftsman, Francesco would surely have had some autonomy in the workshop. The torrent of great instruments that emerged in this period, including the ‘Viotti’, ‘Soil’, ‘Parke’, ‘Sarasate’, ‘Alard’ violins and the ‘Batta’, ‘Bass of Spain’ and ‘Gore-Booth’ cellos, must all have some debt to him. Identifying where his hand lies is less easy. The role of Omobono is even more obscure. We know from the Testament, and from surviving instruments with his own label, that he was a maker in his own right. 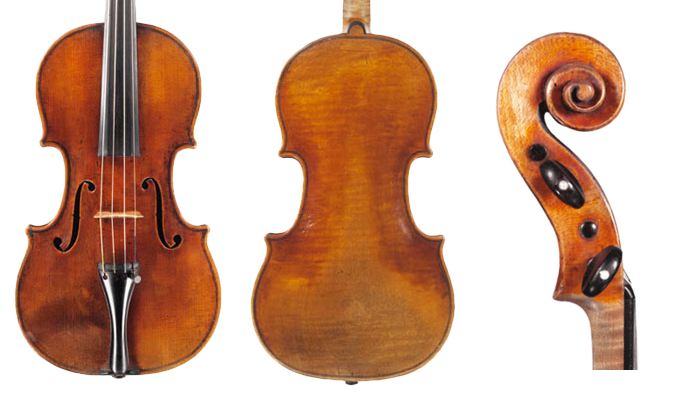 Looking at the forms in use at this time, we find the one cello form, the ‘B’ model, one viola form, the ‘CV’ or contralto viola, but three distinct violin moulds, the ‘P’, ‘PG’ and ‘G’. Although these forms do show slight differences, most significantly with the large ‘G’ form, it makes sense that three moulds were in use for the simultaneous construction of three instruments by three pairs of hands. Omobono, however, to judge by the quality of his known work, was not on a level with the others. The c. 1700 ‘Blagrove’ credited to him is highly unusual. The outline is unruly to the point that it is questionable whether it was produced from any of the known forms, and the back is of plain willow. 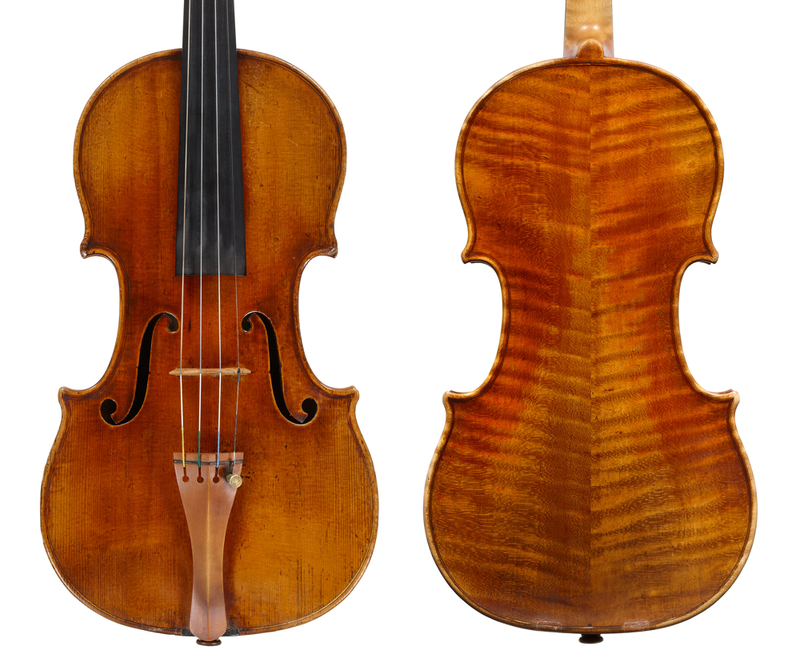 It is hard to imagine it being offered as a violin made by Antonio or as a product of the Antonio Stradivari workshop at that date. One can almost imagine it being made surreptitiously, behind the old man’s back. As Omobono was 21 at the time, it seems unlikely that it was his ‘apprentice piece’. In 1716 Giovanni Battista Marino was 13 and very likely already initiated into the workshop. We knew nothing of him before the discovery of the Testament, since his early death means there are no independently labeled instruments made by him after his father’s demise. It has been speculated that it may have been Antonio’s intention to retire at this stage, with Francesco responsible for Giovanni’s training. It has also been proposed that the enigmatic ‘Messiah’ violin of 1716 was Giovanni’s first completed effort, and was kept in the family home until 1775 for sentimental reasons. If so, he must have been a particularly precocious craftsman. From 1716 a subtle variety of styles enters the work of the Casa Stradivari. There were presumably at least three craftsmen at work plus one apprentice, the young Giovanni Battista, and there are distinctly different approaches to the soundholes and scrolls, and slight shifts of personality. These suggest a more democratic environment in the workshop, with Antonio relinquishing some of his authority. But another turning point occurs with the death of Giovanni in 1727. The shock may have convinced Antonio to return to full-time leadership of the workshop, but it also brought in another talented craftsman, Carlo Bergonzi. His hand is apparent in at least one well-known instrument of 1727, the ‘Fruh’ cello. The handwriting on the various paper patterns in the Stradivari collection offers some clues to the sons’ roles. The majority of the autographs are certainly Antonio’s, but the hands of both Omobono and Francesco have been identified by Chiesa on a few other papers. In most cases these are drawings concerned with plucked instruments, which largely seem to have been notes of instruments by other makers. The only obvious exceptions are the viola d’amore drawing of 1727, annotated by Omobono, again probably an instrument by another maker and studied in the workshop rather than a design originated by the Stradivari themselves, and the soundhole drawing for the ‘B Picola’ cello model. This model appeared in 1727 and the soundhole drawing appears to show the handwriting of Francesco rather than Antonio. This seems significant, given that the output of cellos from the workshop remained undiminished throughout this period – an extraordinary feat for Antonio, by now aged 83. There is also the intriguing ‘Carbonelli envelope’. This folded paper inscribed by Francesco contains the designs and perforated patterns for the decoration of the 1722 ‘Rode’ violin, the last of the series of decorated instruments made by Stradivari, evidently ordered by the Marquis Carbonelli of Mantua in or before that year. From 1730 the level of craftsmanship within the Casa Stradivari becomes gradually heavier and looser. 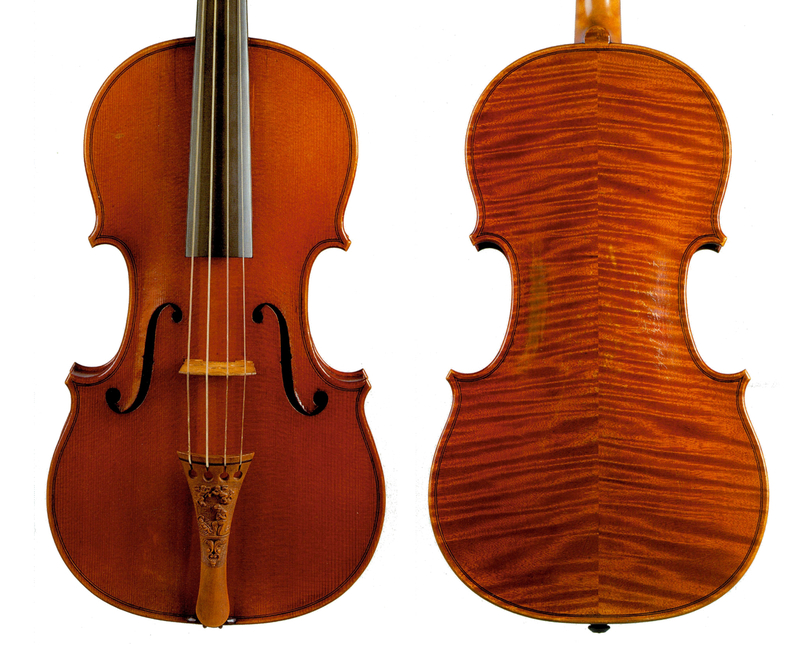 The marvellous ‘Habeneck’ violin of c. 1734 has wholly asymmetrical soundholes, thickened edges and a fuller, broader arching than any previous example. The scroll chamfers are loose and plastic, with a markedly heavy tail to the eye. In general these late instruments are known for the dark sound coming from the slightly extended ‘f’s and full, strong arching, but it is hard to see any but Antonio’s hand in the purfling. It is intriguing to imagine the Stradivari household in 1734. Antonio was by now 86, but his family was also aged, with no grandchildren yet to continue the line. His second wife, Antonia, was 66, Francesco 60, Omobono 51. The youngest occupant of the household was Paolo, aged 22, and the only one to marry and father children himself, albeit after Antonio’s death. Are we to read this as another sign of Antonio’s dominating and controlling position in the family home? It seems to us now a curiously unbalanced, almost unhealthy environment. And this was in the confines of the smallish building on the Piazza San Domenico, which was also in effect a violin factory, producing on average 15–20 instruments a year, with bows and in all probability cases and other fittings too. In Part 2, John Dilworth looks more closely at the instruments of Francesco and Omobono and traces their hands in the output of the Casa Stradivari.